Out of the field, into the parlor -- sunflowers couldnt be more trendy! Brighten any occasion with this joyously nouveau floral arrangement. 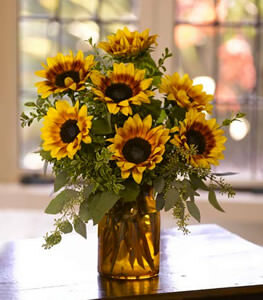 An amber-colored vase, filled with bi-color sunflowers and oregonia, accented with seeded eucalyptus. Thank you so much for such quick delivery, Lynn loved them and was very surprised. just the effect i was looking for. thank you so much.